KAMPALA, UGANDA (DAILY MONITOR) -- On December 10, 1989, besieged by popular protests and a mutiny by unpaid soldiers, President Mathieu Kerekou of Benin called a sovereign national conference and abandoned the one-party politics he had pursued since 1974. Two years later, the Beninese voted Kerekou out, replacing him with Nicephore Soglo, a former World Bank technocrat. By 1993, Gabon, Congo, Mali, Niger, Togo, Zaire and Chad had convened National Conferences to rewrite their constitutions and adopt multiparty democracy. A new era of freedom had dawned in Africa. In the four years from 1990 to 1994, 29 countries held multiparty elections. Incumbents lost elections in 13 of them: Cape Verde, Sao Tome and Principe, Benin, Zambia, Mali, Congo (Brazzaville), Madagascar, Niger, Lesotho, Burundi, the Central African Republic, South Africa and Sierra Leone. In the previous 30 years, only Aden Abdullah Daar of Somalia, of the 25 presidents who had lost power in Africa had lost through an election. Political change used to be violent and often lethal. Between 1960 and 1990, Africa had 64 successful coup d’états and 114 attempts. Twenty-three presidents and prime ministers had been assassinated, 44 States had experienced either a coup or an attempted coup. There was, on average, one successful coup every 5.6 months. Since 1990, there have been 67 attempts but only 30 successful coup d’états, an average of one per year. Coups are relatively bloodless; only three presidents and prime ministers have been killed. Coup makers used to suspend constitutions. Now they leave them intact. Coup makers never yielded peacefully. Now they yield to popular resistance and diplomatic hostility. Observe how quickly Mali’s Moussa Sanogo in 2012 and Burkina Faso’s Gilbert Diendéré in 2015 were forced out. In November 2017, the Zimbabwean army forced Robert Mugabe out of power but rejected claims that theirs was a coup d’état. The 1990 transitions also ushered in a wave of constitution-making. Between 1960 and 1990 more than 130 constitutions were over-thrown in Africa. Since then, Africa makes constitutions at the rate of two a year. In the 27 years between 1990 and 2017, 48 constitutions were made, falsifying the old sobriquet that “Africa was the graveyard of constitutions”. Countries that didn’t draft new constitutions, like Tanzania, made extensive changes to their old ones. And yet, looking back from 2018, something is amiss. Elections are regularly held and ran by commissions that are, on paper, powerful and independent. Yet fewer incumbents lose elections. Electoral violence in elections is more frequent as recent examples in Cote D’Ivoire, Kenya, Zimbabwe, Uganda, Ethiopia, Chad and Zambia show. Though thirty-six incumbents have lost elections since 1990, the picture darkens on close inspection. Incumbent turnover was highest between 1990-2000. Since then they have been unusually resilient. Take a random year, 2016. Eighteen presidential elections were held that year. Incumbents were re-elected in eleven; new ones in six and one election postponed, in the DRC. Incumbents lost only in Ghana and Sao Tome and Principe. Term-limits on the tenure of presidents were introduced in the 1990s but since 2000 nearly 20 presidents have either scrapped them outright or had courts read them out of the constitution. Even so, a 2016 Afro-barometer Survey of 34 African countries found that 75 per cent of the public still supports term-limits. Evidently, the new constitutions have not consolidated Africa’s fragile democracies. Popular faith in democracy remains reasonably high but dissatisfaction with elected leaders has risen. A 2017 Afrobarometer survey of 36 countries found that 61 per cent of the public had more faith in local chiefs than politicians. The gap between what the transitions promised and what democracy has delivered now tempts leaders and citizens alike to flirt with autocracy. Strongmen are now Africa’s most admired leaders: Nigeria’s Mohammed Buhari; Rwanda’s Paul Kagame and the late Meles Zenawi of Ethiopia. This dalliance with dictators may explain why so many army men get elected into office. As the Economist recently noted, of the 90 presidents and prime ministers elected in Africa since 1989, 45 per cent are military men, that is army ex-officers or former rebels. Civilian presidents in Kenya, Rwanda and Uganda, for example, regularly recruit officers into civilian jobs. Constitutions, bills of rights and independent courts promised a new era of the rule of law but they are routinely ignored. Over the last two decades, parliaments have become independent but MPs have turned into parasitic rogues, much like presidents — grasping and hungry for extravagant adoration and exorbitant salaries. Their avarice has undermined oversight, freeing president to ignore the public good. Though some constitutions, such as the 2010 Constitution of Kenya, have devolved power to sub-national units, local leaders have proved as predatory and addicted to hefty allowances and foreign junkets. Like Parliaments, Judiciaries are autonomous. Yet in too many countries judges still kowtow to presidents, especially in election disputes. The loud gasp heard around the continent when the Kenyan Supreme Court first nullified and then ordered a repeat of last year’s presidential election shows how rare judicial spine is. When petitions are filed — as in Uganda, Zambia, Gabon, and Ghana — judges usually find evidence of fraud and illegality. Still, they uphold the results, mostly with the shambolic formula that ‘irregularities have not affected the result’. In some places — Lesotho, Botswana, Swaziland — corruption and incompetence persist, undermining the courts. The emerging picture isn’t a pretty one. Democracy and constitutionalism may have come to Africa to stay but they must survive greater stress tests before they are fully bedded-in. Kenya’s divisive election in August last year replays a new trend in Africa: An electoral crisis that rapidly metastasises into a constitutional one. Mr Kenyatta won an October 2017 repeat election ordered by the Supreme Court after it nullified an earlier one held in August. Mr Raila Odinga, Mr Kenyatta’s chief opponent, boycotted the re-run, dissatisfied with Kenya’s electoral management body — the IEBC. He calls Mr Kenyatta illegitimate and has had himself sworn in as “the people’s president.” Mr Kenyatta bristles at the charge and has taken to strong measures. Recently he shut down free-to-air TV, mainly to black out live broadcast of Mr Odinga’s ‘swearing in’. He has arrested Mr Odinga’s allies and, against clear court orders, deported a citizen who officiated at the ceremony, Miguna Miguna, to Canada arguing that he isn’t Kenyan. It is a familiar story. Controversial elections followed by violent protests and constitutional crises. This script, increasingly common since the mid-2000s, reflects a growing claw-back on political freedoms reform. Is Africa on the cusp of a democratic reversal? The twenty-four elections scheduled, this year should help answer that question. Of these elections, nine are presidential contests. A tenth presidential election, in South Sudan, has been called off. DRC’s 2016 election was re-scheduled to this year. It may not take place. Controversy, perhaps even violence, is expected in many of these contests. What follows is a brief outlook of six countries: DRC, Sierra Leone, Eqypt, Madagascar, Cameroon and Mali. The Democratic Republic of Congo, DRC’s, long delayed election may finally take place at the end of this year. Violence is inevitable and a return to chaos and breakdown is likely. Each election since 2006 has been controversial and violent. The problem is Mr. Joseph Kabila, the son of Laurent Desire Kabila, the rebel leader who ousted Mobutu Sese Seko in 1997. The younger Kabila came to power at 29 when his father was assassinated in 2001. Though reticent, he initially impressed friend and foe alike. In a matter of months he replaced the late Kabila’s cabinet with a youth team of technocrats; pensioned off his father’s power men in the armed forces; ended the DRC’s interminable wars; delivered a new constitution in 2005 and repaired relations with the international community. Soon he proved both venal and incompetent. His first elections in 2006 were contentious and violent. State media, the special police and other security forces were deployed to contain his opponents, forcing the veteran opposition leader, Etienne Tshisekedi, into a boycott. Kabila’s main rival, convicted warlord Jean Pierre Bemba disputed the results to no avail. Kabila appointed as minister of the presidency a former governor of Katanga region, Katumba Mwanke, an addicted deal maker who was soon selling hundred of millions of dollars worth of DRC’s mining rights for such low prices that some investors got back their money before the DRC got a penny. Five years later, in 2011, Kabila was re-elected for a second and, in theory, final term in another even more violent and disputatious election. Results from 2,000 polling stations in Etienne Tshisekedi’s strongholds ‘got lost’. 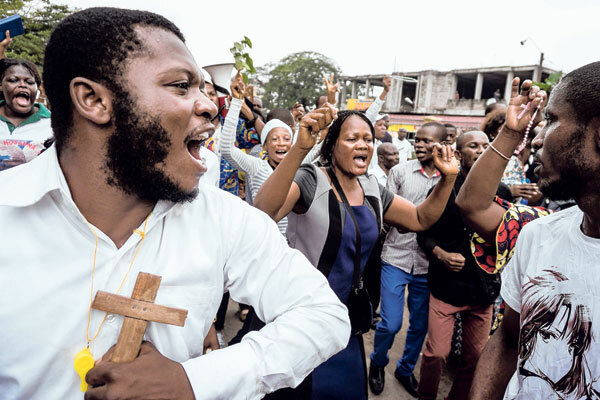 The DRC’s Roman Catholic bishops described the election as “treachery, lies and terror.” Kabila’s term should have ended in 2016. However, in 2015 he had parliament pass a law that mandated a census to be done before any future election. His supporters promptly pushed for the 2016 election to be delayed until a census was done. Riots and protests followed. The Electoral Commission then postponed the elections to 2018, giving Kabila an unlawful two-year extension. In the meantime, the 2002 peace agreements had unraveled and the DRC’s rebel groups splintered further even as new ones emerged. As the country heads to elections later in the year, it is teetering on the precipice, again. Western governments have imposed sanctions on Mr Kabila’s close advisors but these have not worked. The Catholic bishops tried and failed to find a settlement to the crisis. Mr Kabila has ignored the Saint Sylvester accord, the peace agreement the bishop brokered in 2016 setting a framework for dialogue; agree terms for presidential elections and foreclose any changes to give Kabila a third term. She was been named in the Panama Papers as co-owner of Keratsu Holding Limited, a 19 per cent owner of Congolese Wireless Network SPRL, which, in turn holds a 49 per cent stake in Vodacom Congo SPRL, part of South Africa’s Vodacom Group. Last year, Vodacom SA reported that its customers in the DRC had grown by 21.8 per cent over the previous year to 10.4 million. The Kabilas are in the money. With the deck thus stacked, peaceful polls are unlikely. There are conflicts in many provinces, a fact tailor-made for Kabila’s schemes to derail polls yet again. 2. Democracy in Africa: Successes, Failure and the Struggle for Political Reform by Nic Cheesman. International Crisis Group, Global Witness and the Institute for Security Studies on the Democratic Republic of Congo, Mali, Madagascar, Sierra Leone, Cameroon, Chad and Egypt.